Nowadays, numerical models are increasingly used to understand and predict climatic issues such as global warming, rising sea level, or shift of oceanic circulations. To answer those questions, numerical models compute a collection of data from an initial setup, allowing us to first visualize the actual state and then the evolution of the temperature, sea level or oceanic circulation around the world. But how can we know if the output is/will be in agreement with the reality? To validate a numerical model, we still have to compare the actual state given by the model with its in-situ observations. 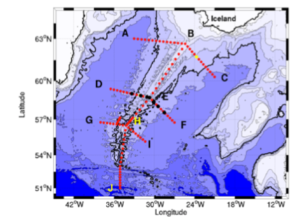 But in-situ data are still too often lacking, and cruises are thus carried out. The new set of data is firstly analysed to document the general circulation and to identify new mechanical processes, and secondly used as benchmark for models. Currently my work is to document the oceanic circulation across the Reykjanes Ridge (South of Iceland) where very little data is available. A strong current-bathymetry interaction could impact the circulation, hence the need for better understanding of this process. To fill this gap, a cruise (RREX) was carried out in June 2015 and another is planned in July 2017. 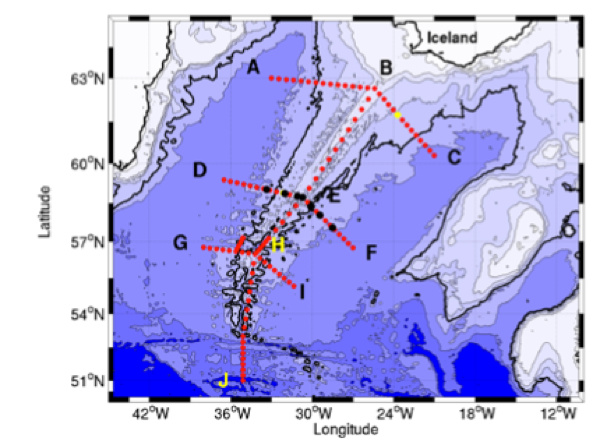 During the 2015 RREX cruise, a lot of new in-situ data were obtained along 4 sections (figure 1), such as velocity of the flow and salinity-temperature-oxygen profiles. Moorings were also deployed and will be recovered during the second cruise. Up to now, I have studied the data of the first cruise, which are of good quality, allowing us to fully address our scientific objectives. Because I was not on board in 2015 I cannot tell you how the cruise was, but I will certainly keep you inform of the general ambiance during the second! Figure 1: Map showing the hydrological station locations during the RREX cruises.